Haven't updated this in a few years! New(ish) one's in blue above. Favorites still Detroit and Dallas. The international (E) terminal in Atlanta is pretty good as well. If I'm motivated later I'll try to organize it a little better. Was just looking at a map a few years ago I think and not going alphabetically. Boston's Domestic terminal was awful, Atlanta's International was epic! Typically I got to Boston early and Atlanta late, wish the circumstances were reversed. ^ ha, I've just (like an hour ago) dropped my Dad off at Manchester airport, he's flying via Atlanta and we were just saying that it was a good airport. EDIT:having said that, apparently he had a nightmare transfer there (big Qs at immigration and security, only just made the connection) and then managed to lose his bags in the car park (that would be HIS fault tho). Hmmm. Detroit and Cleveland are good, And Fort Lauderdale is okay. Still loathe Stansted with an absolute passion. Horrible to get to, always far too busy for what it can handle at security, at departures, at the gate. Fortunately not had to ride the stupid ing tram on my last few visits. At least passport control finally had all their e-passport scanners open yesterday because the last few times they've had 2/3rd's shut. Oslo Gardemoen was brilliant, easy to navigate, clean, spacious, loads of food options at every area of the airport, and the transport option all linked in the one building. Don''t think I commented on just how god-awful Faro airport was too, the actual building looks very impressive but it wasn't ing finished so we walked out of arrivals into a marquee tent to sort out transfers etc...with piss-leaking portakabins propped up alongside. Had the pleasure of flying from Detroit on a few occasions now and I've been impressed everything. The terminal is one straight line with loos and shops every so many feet. So much seating, easy to navigate, find departure boards and so on. It's spotless, too. So yeah, Detroit is my favourite. Detroit is great! 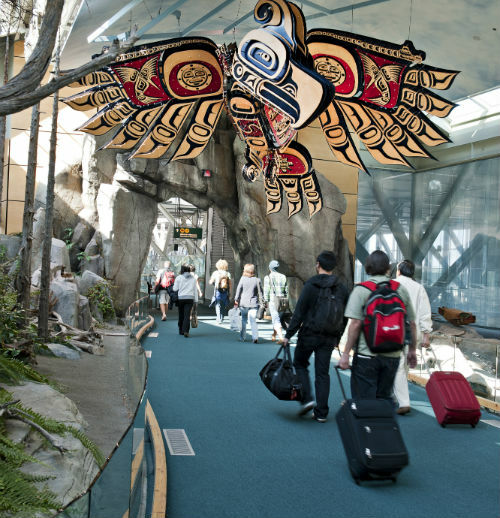 It's the closest (big) airport to me and is filled with a variety of cultural shops! The fountain was pretty impressive too IMHO. The only bad part of the airport is the road to get there. It can be a bit of a tight fit. CSLKennyNI and Thekingin64 like this. 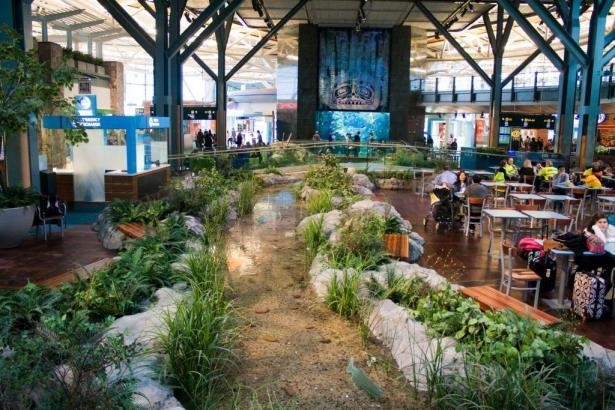 Also, the Vancouver airport looks fab! Might as well do a little update. I forgot about Boston Logan and I also added some smaller, regional airports to my list. iac17 and Zek_Teh_Kek like this. Manchester was a surprisingly pleasant airport when I went, but they were all pleasant from what I remember. In terms of airports I haven't been to, I think Dubai deserves a mention, as that arrivals lounge literally looks like a palace! Most of them tend to blur into one to be honest, in that I hate the vast majority of them. I love being in a new place, but I despise the process of actually getting there. A few of those are obviously just tiny, local airports, but to fair, while they're not great as far as the facilities go, they're usually really quick to get through. I'm not going to include the little ty ones in the worst list, just more major ones. Singapore - Huge, yet incredibly efficient and actually a pleasant place to have to hang around for a couple of hours. Liverpool - Favourite in the UK and not just because it's the closest to me. It's small, but has everything the bigger airports have and some that they don't, including fast food and coffee chains. Always get through really quickly as well. Could do with a rail link though. Luton - Disgusting, vile place. Feels like an overcrowded bus station from the '60s. Moscow Domodedovo - Poorly planned and laid out. Stupidly inefficient. Ben Gurion - Actually a nice airport (FAB central fountain thing), but ridiculous security. I was questioned by 4 different people and had everything in my bag swabbed. Apparently, this is normal, and this was leaving the country. Paris CDG - Honestly, fly to Beauvais and take the bus into the city. CDG is a horrible introduction to Paris, and the train ride into the city, through the gratified slums, is disgusting. Wow!!!! . You've ticked some airports off. As I'm an aviation enthusiast as well as a coaster enthusiast, I can put a bit of info into this thread reply. And I suppose Luton due to the amount of Airbus A320s and 319s that go into there. Newquay is just in the middle of nowhere so a shout for that aerodrome too. Non UK airports, hmmm Lisbon is distinctive because it's so desolate. Do love the city so go quite regular. Tegel has to be the weirdest with the set-out of security at your individual gate and layout of carousels and waiting areas etc. Worse.. Barcelona ( massive queues in T1 for check in) and Manchester T3 as it's the most glum terminal you could wish to fly from and the staff there are quite rude. All the rest are ok tbh that I've travelled to.